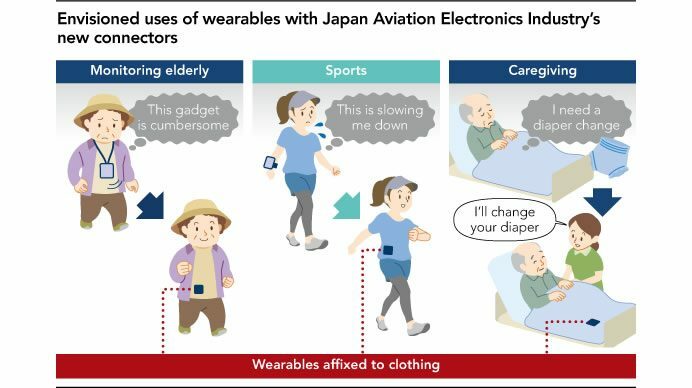 Japan Aviation has developed a thin connector (2 mm thick) with improved elasticity for wearable devices that are attached to clothing. 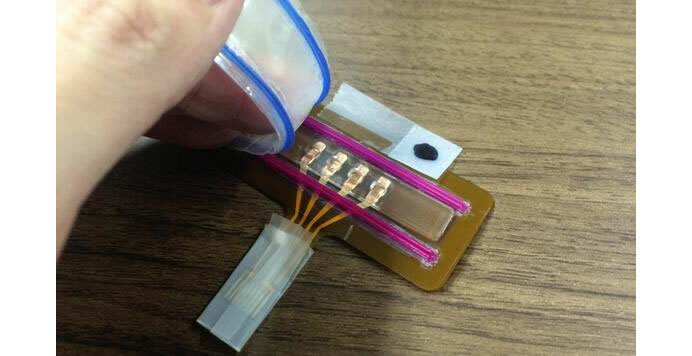 The connector consists of two pieces of highly elastic rubber materials that are bonded together to connect a wearable’s electronics to a fastener. Measuring about 2 mm thick, the light product feels as if part of the body even when attached to clothing. The fastener can be easily removed from clothing before washing. A metallic film in the connector is placed over fine bumps on the rubber surfaces. The bumps are then meshed together to form an electrical circuit that activates the device. The rubber is greaseproof and waterproof to protect electronic components from sweat and rain. The connector allows batteries, sensors and communication components to be attached to a device that is affixed to clothing. The thin connector eliminates body discomfort as once attached to the clothes it can measure biometrics and emit radio waves for communication. The technology will pave way for the development of new devices which will eliminate the discomfort during strenuous activities caused by todays devices attached directly to the body, like the wrist, waist and other parts. The new device can be used as a sensor for monitoring elderly at care facilities or other locations. Planned applications for the connector include the medical and sports fields. The new connectors will allow devices to be attached to an area which is not practical to attach now. The company will team with a developer of wearable devices for clothing to commercialize the connectors.